Scheduling a meeting sounds like an easy task. Often times people are surprised how difficult it can be when you have multiple attendees, with varying schedules and limited availability. Add virtual employees and overseas colleagues and before you know it, you have a mess on your hands. 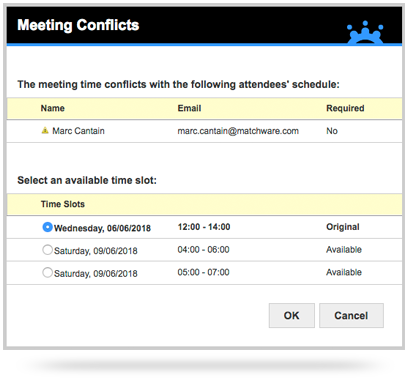 To resolve this common issue, MeetingBooster includes an intuitive Conflict Resolver which will notify you if your chosen appointment time is available or not, and will even let you know which attendees are not available and suggest alternate times that work for the group. MeetingBooster’s MS Outlook plugin installs seamlessly with your current Outlook system and includes the Conflict Resolver. 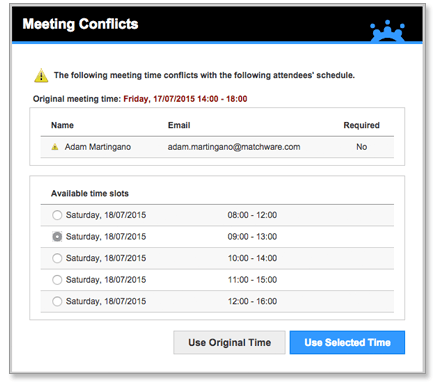 The Conflict Resolver automatically activates when you schedule your meeting. MeetingBooster’s Conflict Resolver is a part of the MeetingBooster Outlook plugin, which means that any user that installs the plugin can benefit from this feature when scheduling a new meeting. A user simply schedules the meeting through Outlook’s MeetingBooster tab as they normally would, invites the required attendees, and the Conflict Resolver will launch, letting them know if there are any issues with certain attendees at the selected times. If there are any conflicts with the invited attendees at the designated meeting time, don’t worry, MeetingBooster will let you know which attendees have a conflict and will give you some alternative times that work for the group. If you have to maintain the original meeting time, there is an option to keep the designated time and ignore the conflicts.